The FB23-3928RSS8 is a 4 Rack Unit (4RU) in-rack splice shelf designed to support up to 96 individually spliced fibers. The fiber housing has a slide out master panel that allows for accessing splice trays for ease in installation and maintenance. 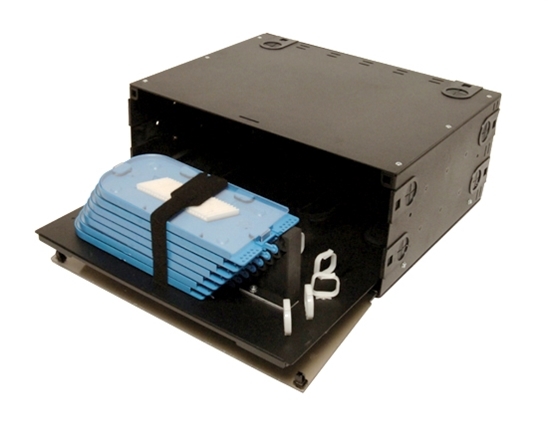 The fiber enclosure supports up to four 24 fiber splice trays. Trays are hinged to allow for accessing splices in trays beneath to eliminate the requirement for tray removal. The FB23-3928RSS8 is one of a family of units that support fiber splicing and termination in rack mount applications. Black, Aluminum. * Note: One splice tray included. Additional splice trays sold separately.